We are proud to announce that after extensive detailed structural analysis, cost and time, the HAPP25 model is now available with Australian Standards certification and can easily be registered with WH&S by HAPP for your reassurance. WH&S require design registration and formal processes and procedures to be followed in the workplace. Our WH&S package includes the registration documents, the necessary procedures and log books to implement a documented operation / maintenance of the hoist. We still want this hoist to be affordable hoist for customers who do not require the WH&S kit, so we have split the cost of the HAPP25 – the purchase of the hoist and/or the WH&S kit. The happ25 includes 3 drip trays complimentary, and a tool tray which can either hold your tools between the runways, or be the base of your jacking beam if you want to use your own standard bottle jack, or we sell the AJ10 or AJ20 air jacks. We also sell both the hand pump model and air pneumatic jacking beams – mini scissor lifts. All lifts are inspected TWICE by external quality assurance engineers during the production assembly. Our steel columns are 5mm which is thicker than what is required by WH&S. All other companies are only at 4mm. We have included TWO extra strengthening beams under EACH runway per Australian Standards. We have TRIPLE safety mechanisms that are now required for the latest Australian Standards testing. Our locking mechanisms are every 130mm, not every 150mm like other companies. Our cables are 12.5mm thick. They have been tested against Australian Standards requirements in NATA registered laboratories in Australia and exceed the Australian Standards requirements. 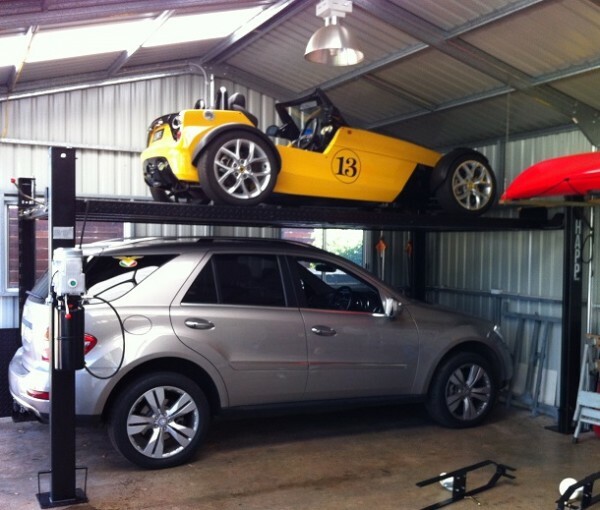 The HAPP 25 four post hoist, with hydraulic lift is ideal for both businesses and the home enthusiasts that not only want a hoist to work on their cars, but also want to increase their parking spots. It is our longest hoist, making it suitable for any large based vehicle.